- 24 / 7 @ 40℃: Guaranteed to deliver 1500W continuous power. - 80 PLUS Silver certified – with 87-91% efficiency @ 20-100% load under real world load conditions. - Robust and dedicated quad +12V rails(30A for 12V1 & 12V2, 50A for 12V3 & 12V4) design provides superior performance under all types of system loading. - High quality Japanese capacitors: ensure superb performance and reliability. - Solid state capacitors: great stability at higher operating temperatures, frequencies and currents. - Multi-GPU ready: 8 x PCI-E connectors support up to 4-way ATI CrossFireX and Nvidia SLI. - Designed to support latest Intel/AMD multi -core CPUs. - Active PFC with PF value 0.99 - less harmonic pollution, greater efficiency. - Ultra-silent operation with intelligent 13.5cm cooling fan speed control. - High reliability: MTBF>120,000 hours. - Built in industrial-grade protections: over current, over voltage, under voltage, over power, over temperature and Short-Circuit protections. - Safety / EMI : UL/CUL, CE, FCC, CB+Baurt mark, GOST and BSMI certified. Japanese capacitors provide uncompromised performance and reliability. Maximum efficiency up to 91% under wide load range. Built in industrial-grade protections: Over Current, Over Voltage, Under Voltage, Over Power, Over Temperature and Short-Circuit Protections. Toughpower 1500W adopt 13.5cm cooling fan with intelligent RPM control guarantees cool performance and silent operation. Cable management design improves internal airflow and reduce clutter. Hybrid mode will cause graphic cards load range from Max. to only 1W. 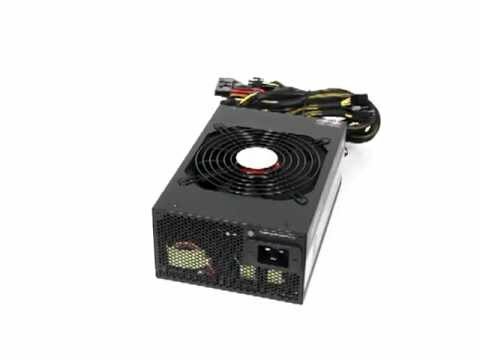 Toughpower 1500W series are able to maintain an ultra tight DC regulation to support the C6 state CPU mode and the hybrid graphic card power saving mode by its ZERO LOAD (0W) Design. New Toughpower Series saves energy through its high energy efficiency of up to 91% and is 80 PLUSR Silver certified. Toughpower Series fulfils the EU guideline for ErP (Energy-related Products) that are scheduled to apply starting in 2010. New Toughpower Series is suitable for use in Energy Star-compatible computers. 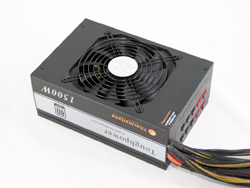 New Toughpower Series helps your PC system operate more power efficiently. Thermaltake considers its full impact on the environment during manufacturing and maintains green facilities to ensure Toughpower meets WEEE & RoHS requirements. Under Voltage Protection: when +12V,+5V & +3.3V outputs under 85% of it's maximum value.